While TenkaraBum aka Chris Stewart visited the Wild West (Tenkara Summit in Yellowstone, Colorado etc.) I got a chance to fish with him the week after Labor Day. We have been going back and forth where to fish but settled at last on heading to Rocky Mountain National Park and fishing the NSV. 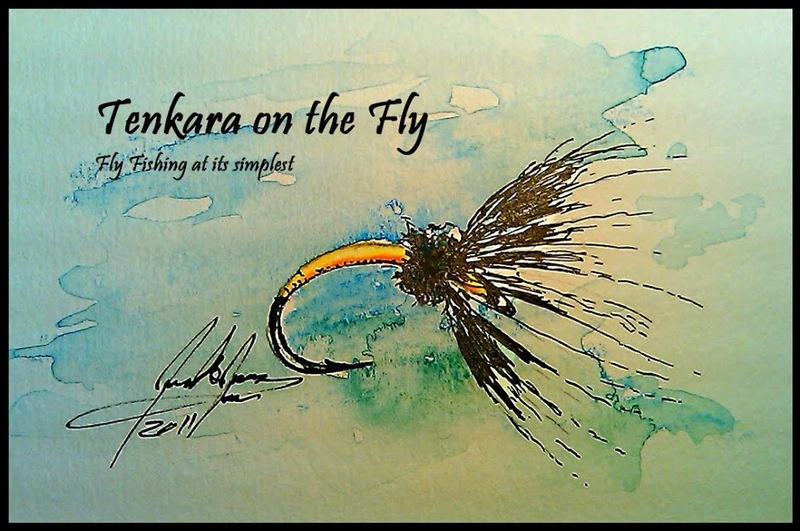 While the intention for this trip was to fish a stream together that Chris hasn't fished for decades (I will not disclose how many decades...), we also had another Tenkara Angler join us, Brian Flemming of Learn Tenkara, who has been working on shooting a feature-length documentary on the introduction of Tenkara to the US. Brian fished only very little that day, but the few casts he managed to squeeze-in yielded a first for him, a Colorado native Greenback Cutthroat. Most of the time, Brian was kind enough to be content with taking pictures and video footage of Chris and I fishing and talking shop about Tenkara. Chris approaching a difficult spot by using a boulder mid-stream to hide. The spot he is targeting is on the far side, to the left of the rock in the upper right corner. Success! Chris hooked a trout, now how the difficult part, landing it. Conditions were not the easiest; while the high flows of the run-off have subsided and dropped a few days before the trip to a more normal 60cfs, the few days before our trip were unseasonally cold with quite some rain which made the NSV swell up to around 95cfs the day of our trip. We were lucky though, even some rain was predicted, we stayed dry all day (that means there was no precipitation, we got plenty wet by wading, including some water spilling into someones waders) and air temperatures ranged from the mid 40ies in the morning to the mid 60ies in the afternoon. We mostly concentrated on pockets, pools, slower water and feeding lanes to present our flies to hungry brookies, greenbacks and brown trout and fishing was very good. While Chris used sakasa kebaris most of the time, I stuck with my personal Summer favorite, a CDC & Elk size 16 on an emerger hook. Both of us did equally well, confirming that high country trout on a high gradient stream are not very selective, they bounce on anything that looks like food if it is presented well. This one might be a hybrid - love the spots! During lunch, we had a feathered visitor. I wonder what flies you could tie? As much as I like fishing alone, fishing with like-minded friends is always a special occasion and treat. Great post Karel. I had a similar experience with Chris & Brian up in RMNP but you stole my lucky spot on the river that shall remain nameless! Hopefully, we'll hit some cutts there next Sunday. Looking forward to it buddy! Great looking fish from a beautiful place. well done! Jason - looking forward to Sunday and hunt some Cutts! Sanders & Joel - thanks so much! Excellent post with some beautiful fish! How does one go about getting feathers from a Stellar's Jay? Nice report. Wish I could have been there!